This is going to be exciting. 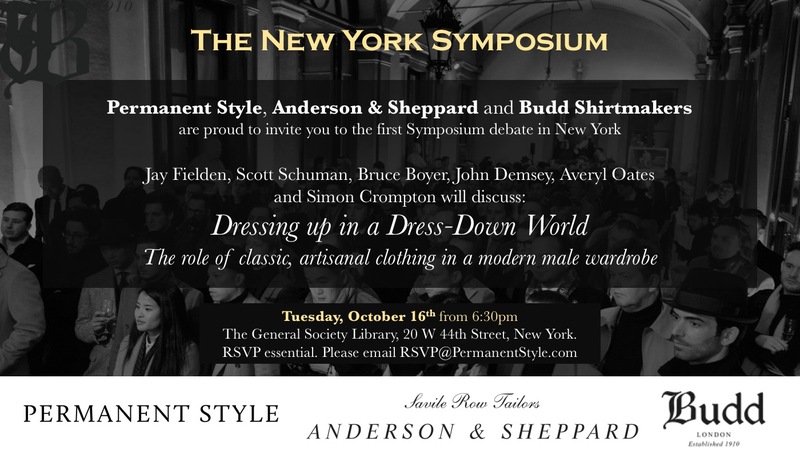 Our first Symposium event outside Florence - and in New York alongside Budd and Anderson & Sheppard. The speakers are big names from across the range of menswear. We're all familiar with Scott Schuman, The Sartorialist, and of course with writer Bruce Boyer. But Jay Fielden, the editor in chief of Esquire, is a great speaker, as is John Demsey - the group president of Estée Lauder and more importantly for us, a big menswear enthusiast. And it's great to have some female input, particularly from Averyl Oates, presenting the view from the department store. I'm looking forward to seeing lots of US readers there. Spaces will go quickly, so please do RSVP to RSVP@PermanentStyle.com. The event will take place in the library of the General Society in New York, with drinks at 6:30 and talk kicking off at 7pm. You can follow the discussion on The New York Symposium – please RSVP! by entering your email address in the box below. You will then receive an email every time a new comment is added. These will also contain a link to a page where you can stop the alerts, and remove all of your related data from the site. My office was W45th St., so very close boy. Can recommend Brasserie 8 1/2, Cafe Centro, Sea Grill, and Rock Centre Cafe as reliable spots if you’re hungry. I saw a comment on another post- think it was the tips on overcoat. You mentioned theres a peacoat in the works and lo and behold, you posted something on Instagram today. This is a marvellous news. I have a dream : a symposium in Paris ! How you you dress for this awful, ever-changing autumn weather? Too cold for only a jacket, too warm for an overcoat and with the occassional downpour of rain. I find it very hard to dress smartly in this weather. Any ideas? My main concern is coping with the rain and the changing weather here in the Low Countries. I will follow your advice. Thanks again! Simon, I sent in an RSVP email, but got no response. Should I assume that I’m on the list, or that I’m out of luck? I live in DC and would come up to NYC for this, but don’t want to make the trip if I can’t get in., Thanks!